Discover winter in London, as the city comes alive with lights and atmosphere after dark. Winter evenings make London seem all the more bright, dazzling and alive. There’s no better time of year to experience its captivating lights and magical skyline, after a day of sightseeing. Here’s what we recommend to make your winter visit to London special. London is full of high points that are perfect for viewing the cityscape, especially after dark. And the good news is, a lot of them are free. We love the Sky Garden in the City of London for its immense panorama. 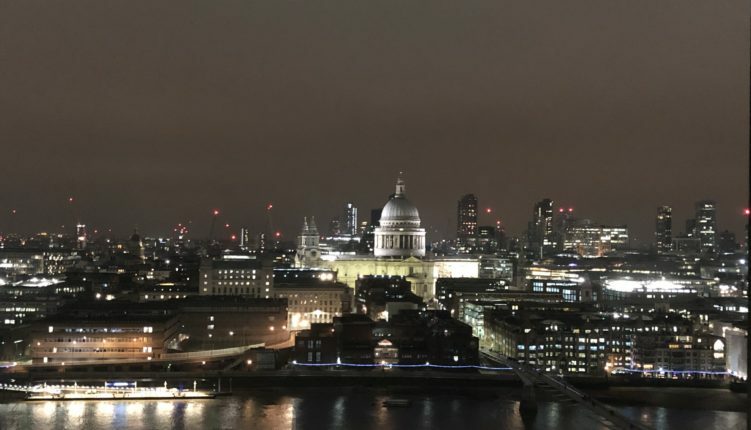 Or relax in the bar on the 6th floor of Tate Modern and soak up that dreamy view of St Paul’s Cathedral lit up, with the river below. You’ll need to book a free entry ticket for the Sky Garden – simply check the website for opening times. If you want to snap the city’s illuminated highlights at their most photogenic and atmospheric, take a stroll across one of its bridges. Head to Westminster Bridge for the Houses of Parliament, Tower Bridge for the ancient Tower of London, or Waterloo Bridge for the iconic, modernist Southbank Centre. If you enjoy sightseeing tours, try one by night. A night bus tour will take you round all the sights in comfort, from Harrods in west London to the Tower of London over in the east. It’s the ideal tour of all London’s iconic places, accompanied by a guide. Experience the energy and bustle of London in its most vibrant neighbourhoods. Central London comes alive in the evening. From the lanterns and restaurants of Chinatown to the boutiques and bars of Covent Garden, its districts are full of lights, discoveries and delights. And there’s always a welcoming cafe or cosy restaurant to escape from the cold.